매력적인 팔레르모에 있는 본 숙소(호텔 코스타 리카)는 부에노스아이레스의 나이트 라이프, 쇼핑, 레스토랑 중심지에서 전망 좋은 위치를 자랑합니다. 이 곳에서 생동감 넘치는 도시의 많은 것을 최대로 즐길 수 있습니다. Guarani Pora, Parroquia Nuestra Senora de Guadalupe, Espacio Pla 등과 같은 다양한 명소에서 투숙객들은 모험을 즐길 수 있습니다. 본 숙소(호텔 코스타 리카)의 훌륭한 서비스와 우수한 시설이 잊을 수 없는 여행을 만들어 줍니다. 24시간 프런트 데스크, 여행 가방 보관, Wi-Fi (공공 장소), 공항 픽업/샌딩 서비스, 여행 안내소 등이 본 숙소의 특색을 더합니다. 본 숙소(호텔 코스타 리카)에는 집같이 편안하고 안락한 총 25개의 객실이 있으며, 감각적으로 세련되게 꾸며진 많은 객실에서 금연 객실, 에어컨, 난방, 모닝콜 서비스, 책상 등을 이용할 수 있습니다. 사우나 등을 포함해 여가 시설이 잘 구비된 본 숙소에서 일상을 탈출해 편안한 휴식을 취할 수 있습니다. 본 숙소(호텔 코스타 리카)는 부에노스아이레스에서의 양질의 숙박을 위한 다양한 시설/서비스를 제공합니다. This is a lovely place with fine rooms, which meet the budget. The common areas are really beautiful and the staff friendly. Just be aware that they do not have an elevator, which can be annoying if you have a big suitcase. be Nevertheless, I assume the staff will help you with that if you ask them! What a great little hotel, super stylish, yet not pretentious. Friendly staff. Clean, modern room, comfortable bed, quiet. The hotel is a former grand personal residence, so it's set up like a home, not a cookie cutter hotel box. It's an excellent value, too. The neighborhood is nice and safe, with several restaurants and cafes nearby. I highly recommend La Choza de Gascon for dinner. Stayed there just for one night, nothing to complain. Lovely receptionist. Would definately stay again. Hotel was very nice, common areas were great for meeting other travelers, room was clean, and bathroom was exceptionally nice. We choose this area for its nightlife and Would defineatly recommend to others! Hotel Costa Rica is such a lovely hotel with character. The owners, the staffs all add to the overall charm of the place. The bed is very comfortable and the property is very well maintained. It's located closed to great restaruants in short walking distance. We have enjoyed our stay. What a wonderful experience it is in the lovely city Buenos Aires, staying with Hotel Costa Rica ! We've enjoyed every minute of it. This was the last hotel of my 3 week trip to Argentina. The manager asked me if I'd had any problems and I was very pleased to say, none. The double room was nice, clean, secure and quiet. No TV. The hotel had a lot of character and was also clean and tidy. The breakfast was good value at 60 Pesos, but I bought a cooked one at a near by restaurant. The location was acceptable, if nothing to shout about, eg. 40 minutes walk to Recoleta. When I departed to the airport, the staff saw me away from the hotel. I thought that very nice. Hotels in Buenos Aires are not cheap. This one was very good value for money though. Staff is very nice and accommodating. Breakfast is nice ( not included). Not far from nice entertainment and food, and shopping. 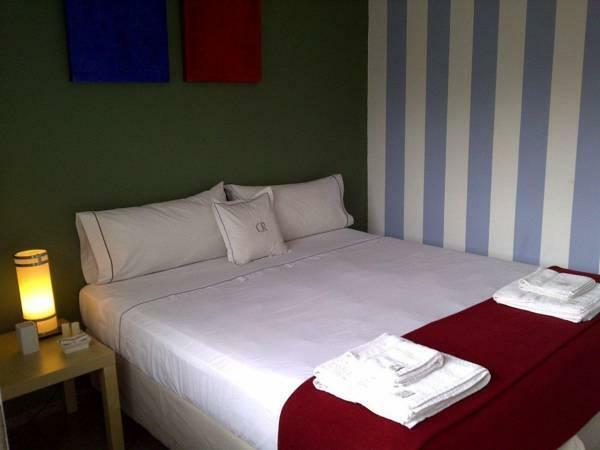 The hotel is conveniently located in Palermo the best area of Buenos Aires. The room that I was in has a great view of the city and the staff are very friendly. a great place to stay, can not recomen this enough. we had a great few days in buenos aires and hotel costa rica was the cherry and the cream on the ice creame.. great interiors and beutiful rooms and common areas. the beds are comfy and rooms with ac and shower and toilet. it has all you need for a good nights sleep.. there are common areas that feels like a interior magazine like livingroom edition. and roof top. very smart designed in a chic way.. stay here if that is in your budget. for a couple it was great. the staff are also very firendly and helpful. and the location is central and it felt safe to walk around even at night. palermo is a great area. Lo más destacable es la amabilidad del personal. La ubicación es perfecta dentro del barrio de Palermo. Como puntos negativos está que la hsbitación era bastante simple. Es baño, por ejemplo, no tenía ducha separada del resto. Y por otro lado, el desayuno no estaba incluido. Muito boa! Foram atenciosos, o hotel é muito organizado, bem localizado e limpo. abbiamo soggiornato due notti in questo hotel non molto distante dalla Movida di Palermo. L'hotel è molto grazioso, ha uno stile di design moderno mescolato a qualche elemento vintage. Le stanze sono piccole ma accoglienti, purtroppo anche poco isolanti. Un'altra pecca è che il wifi funziona solo nella hall. Nel complesso però è stato un soggiorno soddisfacente. Goede ligging bij leuke wijk, schoon en wat betreft interieur mooi.